Enza-Soothe combines the highest quality natural ingredients based on real science with a unique delivery method to help ensure this formula works where you need it most. Our triple-action formula contains bromelain, serrapeptase, and papain, which research suggests can help promote a healthy inflammatory response. Now you can enhance your joint comfort with one convenient formula, with ingredients tested for safety and purity. 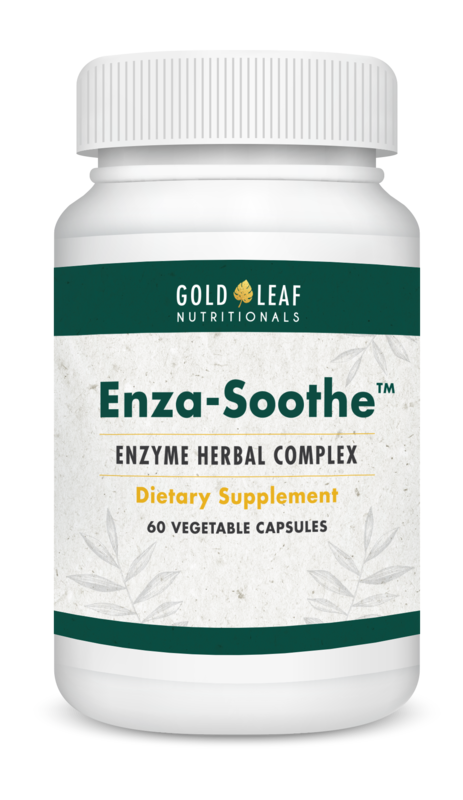 Enza-Soothe is a natural nutritional supplement formulated to help support a healthy inflammatory response by providing a unique combination of enzymes and herbs. Developed by scientists, Enza-Soothe offers a systemic approach to a very common problem by providing what may be one of the most advanced nutrient combinations on the market. Serrapeptase (40,000 SPU):Another systemic enzyme. It has been the subject of a number of clinical studies showing promising results for supporting a healthy inflammatory response. Bromelain (500,000 PU):A systemic enzyme found in the stems of pineapples. This enzyme has been recognized by the Commission E in Germany for its many benefits. Papain (500,000 PU):Another systemic enzyme showing promising results for supporting a healthy inflammatory response. Papain is naturally found in the papaya fruit. Bacterial Protease (50,000 PC):It compliments the other proteolytic enzymes found in this formulation. Devils Claw Root Extract (0.5% Harpagoside)(100mg):Studies show Devils Claw may be beneficial in promoting joint comfort. Ginger Root Extract (5% Gingerols)(100mg):Supports a healthy inflammatory response. White Willow Bark (30% Salicin)(100mg):Used for hundreds of years, it supports a healthy inflammatory response. The Enza-Soothe formula is protected by an innovative, vegetarian capsule. These capsules help protect the enzymes and herbal ingredients from stomach acid so maximum amounts can be delivered inside your body where you need them most. In fact, human tests have shown the capsules are released after they pass through the stomach and into the intestine - just as they’re designed to do. This way, your stomach acid has less of a chance to destroy any enzymes, ensuring they work their magic where they’re needed most. Enza-Soothe is a synergistic formula with ingredients that have been shown to support a healthy inflammation response. It is designed to help relieve joint pain, using a combination of enzymes and other ingredients to help fight inflammation. It is the standard #1 capsule, just a little bit longer than a tic-tac. Most people find the capsules easy to swallow. Can I take it with meals/food? The product works best when taken on an empty stomach. This helps ensure that the enzymes will be fully absorbed. If you have to take it with food, try and take it with a light meal that doesn’t contain protein. Yes, your supply of Enza-Soothe™ is 100% protected by our no questions asked anytime guarantee. You have an unlimited amount of time to try it out. If at any time you’re not thrilled with your results, we’ll refund you every penny of the product price. This supplement gave me joint relief. Over the counter meds are not potent like Enza–Soothe. By the time you try many other various products, you could have been feeling better by using Enza-Soothe. I have pain in my lower back and Enza-soothe gives me such a gentle, natural and quick all around departure from the pain. I am so thankful! It is my go-to natural pain reliever. Enza-soothe does not affect my stomach at all like previous over the counter medicines have and I was walking better in just three weeks. It works when nothing else has! No other product I have used in the past has given me this much relief and that fast. I feel my stiffness disappearing! Enza-Soothe has given me the first relief I’ve had in years, and believe me I have tried them all! With Enza-Soothe, I have noticed that after a day on the golf course I have far less joint discomfort. I am 57. Enza-Soothe is a product that truly works! It is natural and helps to relieve my pain. I recommend Enza-Soothe for anyone looking for a more holistic solution to feeling OLD! Try Enza-Soothe today for less than the cost of a bottle of water a day. Our natural triple-action enzyme formula can start working for you today by revitalizing your joints from the inside out. Start giving your joints the relief they need precisely where they need it most. And… if you aren’t thrilled with the changes in your body, we’ll give you back every penny of the product price.